In a simple ceremony held at the AFP Health Service Command, Mr. Inkwun Heo, Managing Director of LG Philippines, handed over ten (10) 1.5 HP Dual Cool Inverter Split Type Air Purifying Deluxe Airconditioners, two (2) 13kg Inverter Top Load Washing Machines, one (1) 24 cu ft Side by Side Refrigerator and ten (10) 43" Smart TVs to Col. Jeffrey Jake Gallenero, Philippine Army MNSA, Chief of Staff, AFP Health Service Command (AFPHSC). 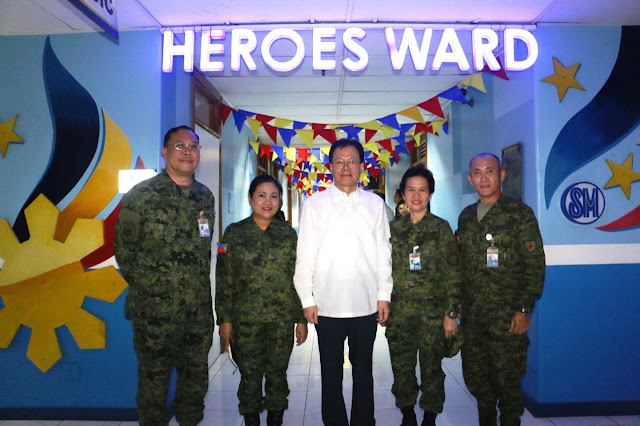 Also present were the chiefs of each operating unit and staff of the AFP Health Service Command. LG Philippines managing director Mr. Inkwun Heo offers praise and appreciation to Corporal Roy Aquino PA who suffered injuries in the Marawi siege. Looking on is LTC Domingo A Chua Jr (MC) PA, Head Dept of Orthopaedic Surgery and Traumatology at the V Luna Medical Center.